Your One Stop for Health Food Products. Established in 1971, Mother Nature’s Food, Inc. has been Eau Claire’s destination for health-oriented food and products. 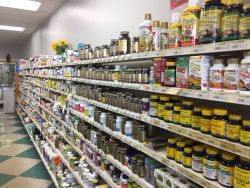 We stock a wide selection of natural supplements- vitamins, minerals, and herbs, health & beauty products, essential oils, natural food items, and more. Our goal is to help you be the healthiest version of yourself! For those who want to live life naturally, there’s Mother Nature’s Food, Inc. As a health food store in Eau Claire, WI we take pride in bringing our customers the very best in natural and organic supplements, clean ingredient health & beauty products, a large selection of essential oils, and natural & organic food items. We know that what we put into our bodies matters and it starts with what we eat. Offering raw and organic nuts, seeds, and dried fruit is a great place to begin. We know that our customers are busy so Mother Nature’s Food offers superfoods like goji, maca, and acai that can easily be added into their meals to enhance their nutrition, giving our shoppers access to foods that taste great and are good for you. We believe in total-body wellness and stand by the products we offer in Eau Claire, WI. Stop in and see our selection for yourself today! We’re happy to answer any questions you might have or help you discover products that are right for you. Our business has been locally-owned and –operated since 1971, proudly serving the Eau Claire, WI community. We’re proud to have a strong selection of supplements, herbs and spices available. We’re happy to offer recommendations, suggestions and information regarding any of the products we sell in our store. In addition to food and health products, we also retail essential oils, beauty products and prenatal products. Fair-trade jewelry, sprouting supplies, kombucha starter kits, Champion Juicers, and distilled water are just some of the “more” that you will find at Mother Nature’s Food. To explore the many food and wellness products we offer at our store or to speak with our friendly staff, stop in and visit us today. We’ll help you find exactly what you’re looking for! Proudly offering health foods and beauty products to Eau Claire, WI and surrounding areas.